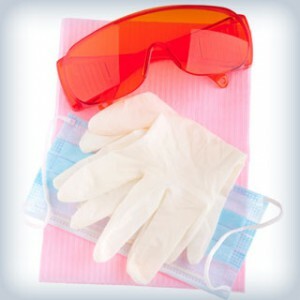 Dental gloves and maskInfection controls and universal precautions protect clients and our team alike. Everyone benefits from rigorous infection control — you, your dentist, and the dental team. The cornerstone in good and safe dental practice is the element of trust. Dr. Horton and Dr. Vranas and our entire team follow procedures recommended by several federal agencies: the Occupational Safety & Health Administration (OSHA), the Environmental Protection Agency (EPA) and the Centers for Disease Control (CDC). We sterilize all reusable equipment, including dental hand pieces. We use an autoclave, a device that kills bacteria and viruses by steam, heat and pressure. The best defense against disease is information. If you have questions or if you would like to request a guided tour of our office, please contact our office at St. Charles Office Phone Number 630-377-1010 .